Most mornings the butcher shop on the northeast corner of Ajijic's main plaza has a line-up of patrons as it opens for business. These customers are looking for handouts. Yep, free food. And, why not? A dog's gotta eat, eh? The kind folks at the Fuente Carniceria distribute fresh bones to the many plaza and town dogs that visit. 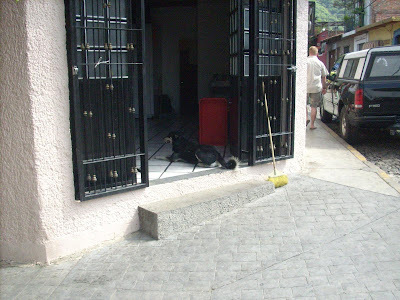 Everyone I know seems to mention from time to time how mellow the dogs in Ajijic are when compared with their experiences with canines in the U.S. or Canada. Our "town" dogs and "plaza" dogs are generally friendly, non-threatening, and seem to have a live and let live attitude toward animals of the 2-legged persusasion. It is rare to see anyone shy away from a dog sitting in the middle of a sidewalk or lying in a doorway. 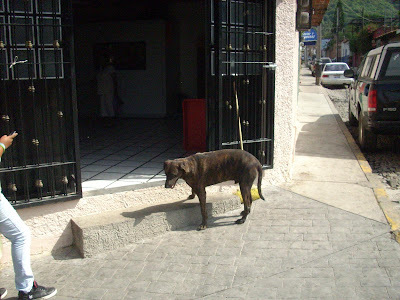 The only agressive or hyper dogs I see are tourists brought to Ajijic by visiting Mexicans, Americans, or Canadians. We love our dogs here in Paradise. Now, as for cats....... in the two years of living here, I may have seen three or four, at the most, scurry about at night. The dogs can roam free here, but the cats seem smart enough to stay off the streets. In the photographs are two patrons of the carniceria. One puppy left without a bone and the other is waiting just a little too far within the door. No one seemed to mind.